We get questions from customers all the time about selling or trading in their car. One of the most frequently asked questions about our Cash for Cars or trade-in programs is regarding customers that still owe money to another lender for their current vehicle. We will buy your car, even if you still owe on the loan and even if you’re not buying from us. Some of our customers are in tough financial spots and trying to sell their car for cash or purchase a vehicle at our dealership to get a more affordable payment and avoid defaulting on the loan. Here are some tips on how to sell or trade in your vehicle and help make the process fast and easy. The first step to selling any vehicle with a loan balance is to contact the lender and get the pay-off amount. Call your lender and request a 10-day payoff. This is the total amount that they will accept to close the loan. That amount is generally good for 10 days. See if your lender will negotiate with you on the pay off. It never hurts to ask, and you may be surprised to find out that your lender will accept a lower amount than what you actually owe. The lower the amount you have to pay toward the bank is either money in your pocket or more value to your trade. Coming in to the dealership with a pre-negotiated 10-day payoff is tremendously beneficial for you and the dealership. Once you have your payoff from the lender, use an online value estimator like Kelly Blue Book to get an idea of the amount of equity or negative equity you have in the vehicle. If You’re "Under-Water" or "Upside Down"
There is a possibility that you are “under-water” or "upside down" on your loan. After speaking to your lender and determining the value of your car, you may find that you owe more than your car is worth. If you are in a financial situation where it is absolutely necessary to get out of your loan, you may be forced to take a loss on the vehicle during sale. If you are using your vehicle as a trade on a cash deal, you may have to put additional money toward the negative value. If you are trading in your vehicle to get another vehicle with a lower payment, the dealership will likely roll the balance into your new loan. Every lender has different processes for closing a loan. They may need specific documents, or information. They may have a separate payment processing center for payoffs. Asking your lender the specifics about the process will save time and prevent possible problems. Trading your vehicle is the easiest way to sell a car that has a loan balance. Dealers, like ours are familiar with the process and will handle all of the paperwork for you. All you’ll need is the information for your current auto loan account. The dealership will help handle all of the paperwork and payoff with your lender. If you’re really stuck and considering walking away, you can allow the lender to repossess the vehicle. If you are left with only this option, be sure to call the lender and offer voluntary repossession. 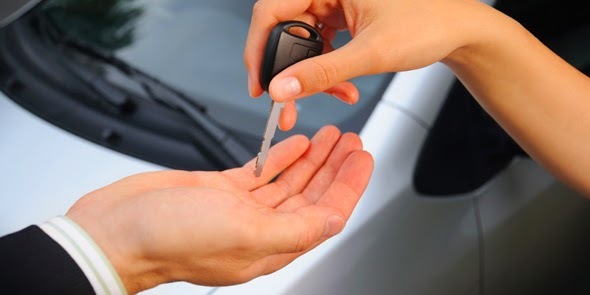 By volunteering to return the car, you will avoid costly repossession fees, and may be able to work out a deal with the lender to avoid them filing a judgment for the remaining balance. If you can avoid repossession, it’s best to do so. Voluntary repossession is always an option, but it should be your last resort. If you’re trying to sell your car through our Cash for Cars program, or using your current vehicle as a down payment on your next vehicle with us. You can use our online trade calculator to get a free appraisal of your vehicle. Then check out our inventory and fill out a financing application.